I recently connected with Kristen on Instagram. She is a talented multi-oracle deck creator and intuitive reader who was inspired by my Aries New Moon Reading to create an oracle spread of her own using decks she created herself. Coming soon will be Kristen's AMAZINGLY detailed and helpful article about how to make your own oracle deck so stay tuned! To receive my new moon readings monthly you can sign up here: New Moon Museletter. 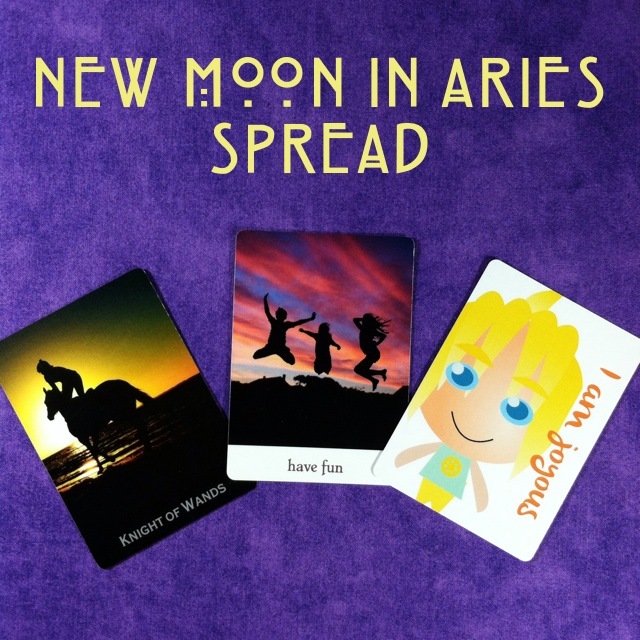 This week, I've been chatting with Kathy Crabbe about making oracle cards, and I noticed she had a wonderful blog post on the Aries new moon. So, I decided to make a simple spread based on her post: How To Get Inspired and Fight To Win This Aries New Moon. Card 1: What do you want more than anything? Card 2: How to get it (by tapping into your Aries Fire). Card 3: Affirmation to support your goal. Card 1: Knight of Wands. This card represents a departure which I'll be making very soon to live in a different part of the country. It also signifies the freedom and adventure I'm hoping this move will help me regain. I'm eager to start over and live life to the fullest. Card 2: Have Fun. I get this card a lot as an admonishment because I'm always so busy working, creating, and trying to stay afloat. But this card shows that adding more fun to my days will help me live life to the fullest. Card 3: I am joyous. Love this card! And it ties in nicely with the positive energy of the other two cards. What fears did you have to break through to write this book? Creative Soul Blog Giveaway: Teri will be giving away two articles she's written: Hildegaard: Yogini in Nun's Clothing and Sophia/Shakti to one lucky winner who comments on this interview by telling us what kind of divinely inspired creative fires you hope to stir up in 2011. Enter your comments below to win. I am very happy to introduce fellow Virgo astrologer and author Emily Trinkaus along with the debut of her brand new column written especially for the Full Moon and for this blog - yahoo! I know you'll enjoy it and I look forward to sharing more of Emily's Full Moon Wisdom in the coming months. Friday's Full Moon is a rare, Blue Moon event -- a second consecutive Full Moon in fiery, passionate Aries. Think back to what was happening around September 23rd, at the first Aries Full Moon. This year we're gifted with two opportunities to get the lessons of the Aries/Libra polarity -- the balance of masculine and feminine, independence and relationship, feisty initiation and measured reflection. Each Full Moon is a time of illumination, revelation, culmination and fruition. The Full Moon in Aries asks: What do you really want? What excites and inspires you? Are you in touch with your instincts, drive and vital life force? Have you sacrificed your authenticity, your passion, your true desires to please your partner, family, society? Are you giving more than you're receiving? This Full Moon is at the very last degree of Aries, highlighting endings and completions related to Aries themes: an aspect of your identity you've outgrown, a way of taking action or relating that's not serving you, a past pursuit or passion that no longer excites you. The two-week period following the Full Moon, while the Moon is waning, is an ideal time for letting go of the old and clearing space for the new. Clean out the dusty corners of your home and psyche, get rid of possessions that are holding stagnant energy, write or sing or paint or dance your feelings and uncover a more vibrant version of your self. On Saturday, the Sun will shift into Scorpio, joining Mercury, Venus and Mars in the sign of magic, transformation and regeneration. While access to invisible power is strong, take advantage of this Full Moon opportunity to perform a simple ritual. Aries likes it fast and fiery: light a candle, write down what you're ready to release, burn the paper, and do a little dance -- or just jump around and shake off the old. The Full Moon will be exact on Friday at 6:36pm Pacific Time, but the energy is powerful all Friday and Saturday. I fell in love with astrology when I was 13 and read Linda Goodman's Sun Signs. Suddenly the world made sense! I've been a passionate student of the cosmic science ever since. The more I learn, the more I'm humbled by its elegance, power and profound mystery. I started giving readings professionally in 1999. I also have a background in creative arts - writing, painting and movement - and founded Portland Women Writers. I love working with other artists and writers to offer support for breaking through blocks and increasing access to the creative flow. To purchase Aries Goddess & Creative Soul Guide "Carolya" please click the link! Or if you're just dying to see more of these oracle card guides, here's a smattering or two (is that the right word?) for your enjoyment!